That’s the wish of club chairman Dave Young before the curtain comes down on the Woodlands campaign with this weekend’s visit of in-form Sedgley Park. Those smiles may have faded as three straight defeats have halted the momentum of a side which had mounted an impressive promotion challenge under coach Warren Spragg. But after a miserable 2017-18 which saw rock-bottom Fylde win just three games all season, Spragg’s side have lost only three of their 14 Woodlands matches at the lower level. The chairman says the reality of a second season in National Two North brings no financial worries, and feels the disappointment of Fylde’s failure to win promotion ahead of their centenary season is countered by the positives. Young told The Gazette: “With my ex-player’s hat on I’m disappointed because you want the club to be playing at the highest level possible, but on the other hand there has been a buzz among supporters this season because we have been playing well and winning games. “Financially, there is little difference between playing in the two divisions but what does help is having a winning side. Young added: “Maybe it has been a couple of games too far and we have been carrying a lot of knocks at the and of a long, hard season. 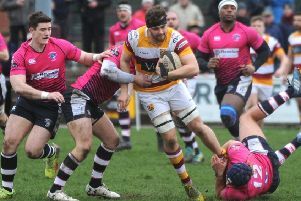 That ‘buzz’ around the club has helped Spragg to retain his players’ services for next season but, first, Fylde will need to halt Sedgley Park’s seven-match winning run in order to regain their top-four spot. Spragg said: “We are disappointed with our recent form. Losing three consecutive games was always a possibility when looking at the fixture list, but I firmly believe we had the ability to win each of the games. “It is important that we don’t let recent form be our overriding memory of this season. We have seen a group of young players respond to last season’s experience of losing lots of matches by overcoming those challenges and dominating games for a large part of this season.